From the LHC to GANIL and ORNL, Sigmaphi has made its contribution to most of the world's major particle accelerators. Founded nearly 30 years ago, this small French company has forged a reputation as one of the foremost manufacturers of magnets for scientific research and proton therapy. Whether in small series or even as a one-off, they are always customised! Brittany in France is well known for its rocky coastline and fine cider – but less for its magnets. And yet… in Vannes, some fifty specialists have been designing, building and measuring the world's most complex magnets for nearly 30 years under the name Sigmaphi. "Our work schedule is dictated by the large particle accelerator projects all over the world and we alternate between periods of relative calm and periods of intense production,"explains design and engineering manager Frédéric Forest right at the outset. Fortunately, these fluctuations are partly compensated by Sigmaphi's second market, that of proton therapy accelerators, where the requirements are comparable but the orders (a little) more regular. Here, Sigmaphi supplies magnets directly or on behalf of large systems integrators such as IBA, Varian, Siemens or even Mitsubishi or Hitachi. When it comes to the market for these small series, Sigmaphi's strength is that it is flexible and quick to respond, handling one design for each order, which may range from a single item to several dozen magnets. Sigmaphi makes just about everything, from solenoids to octupoles, not forgetting curved coils, "kickers" and other oddities. "We can produce magnets weighing from just a few kilograms up to more than 70 tonnes, with a field strength of up to 2T," points out Frédéric Forest. And Sigmaphi will shortly exceed this threshold of 2 Teslas, which is the limit of conventional resistive electromagnets. A year ago, in partnership with the Belgian systems integratorThe part of a fluxmeter that integrates the voltage... IBA, the company began work on its first superconductor design project. This is an exciting challenge involving a now crucially important technology. "Increasingly, new acceleratorParticle accelerators were developed by physicists to study the elementary nature of matter. Nowadays, they are usually immense, highly international... projects combine the two technologies," Frédéric Forest continues. Each magnet produced by Sigmaphi then goes to the Measurement department for a thorough examination. 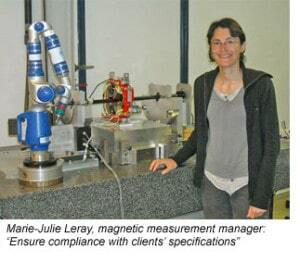 the specifications, and to provide the customer with a detailed description of his magnet," explains Marie-Julie Leray, magnetic measurement manager. The team uses Hall probes to map each point of the field generated throughout the magnet to within 0.3 Gauss and with a relative precision of 10-4. 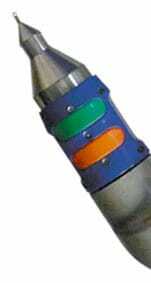 Sigmaphi then uses an integrator (Metrolab's PDI) to map the magnetic flux, trajectory by trajectory. In this way, the company checks the homogeneity of the "good field area", which is usually on the order of 5x10-4. The fluxmeterAn instrument that measures flux changes by integrating the voltage induced on a coil.... is used with rotating coils (or flat coils for the dipoles) designed and built in-house, that have a mechanical precisionPrecision is how closely multiple measurements will be clustered. Also called reproducibility or repeatability. In everyday speech, often confused with... on the order of 0.01 mm. The characterisation operations take 8 hours for a quadrupoleIn accelerators, a magnet with four poles, yielding a highly inhomogeneous magnetic field. See focusing magnet and multipole magnet...., and from one day to two weeks for a dipole depending on the mappingThe process of measuring magnetic field intensity at many different points, in order to understand the structure of the field... area and the number of currents required by the customer.